BOSTON (AP) The injury to free agent Gordon Hayward devastated the Boston Celtics emotionally and threatened to derail their efforts to improve on last year’s Eastern Conference finals appearance. It took about three games for them to figure things out. Kyrie Irving scored 24 points for the third straight game, Jaylen Brown added 18 and Horford had 13 rebounds for Boston, which last beat the Spurs in 2011 – a 10-game losing streak. Irving also had three steals and a blocked shot, and coach Brad Stevens praised his defense. 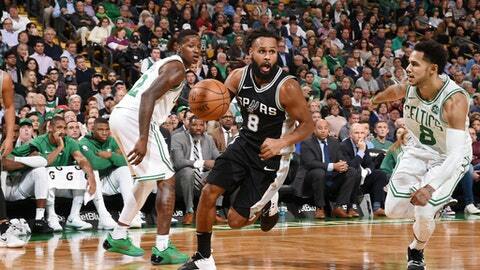 ”You can tell he’s getting more comfortable every time he takes the floor,” Stevens said. Boston signed Hayward in the offseason in an attempt to bolster the team that earned the No. 1 seed in the East. But the deal that swapped Irving for Isaiah Thomas signaled a near-complete break with last year’s team. Since then, they haven’t lost. And Irving is the biggest reason why. Boston led 54-49 at halftime and scored 10 of the first 12 points in the third quarter – eight from Irving on a pair of 3-pointers and a layup. The Celtics point guard was 10 for 15 shooting through three quarters, including 3 for 6 from 3-point range, before sitting most of the fourth while Boston nursed a double-digit lead. San Antonio remains without Tony Parker (left quad) and Kawhi Leonard (right quad), and Popovich rested Manu Ginobili as the Spurs lost on back-to-back nights and fell to 1-3 on a four-game road trip. Rozier scored 10 of the Celtics’ first 13 points in the fourth quarter, eight of them in a 52-second span when Boston turned an 11-point lead into a 93-74 rout. Rozier made just one of his first nine shots before making four in a row in the fourth. Spurs: Made a 3-pointer for the 982nd consecutive game. … Popovich was left waiting for career victory No. 1,155, which would tie him with Phil Jackson at sixth on the NBA’s all-time list. … Popovich’s next road win will be his 500th, something just three coaches in NBA history have achieved. Spurs: Host Golden State on Thursday. Celtics: Host Sacramento on Wednesday.